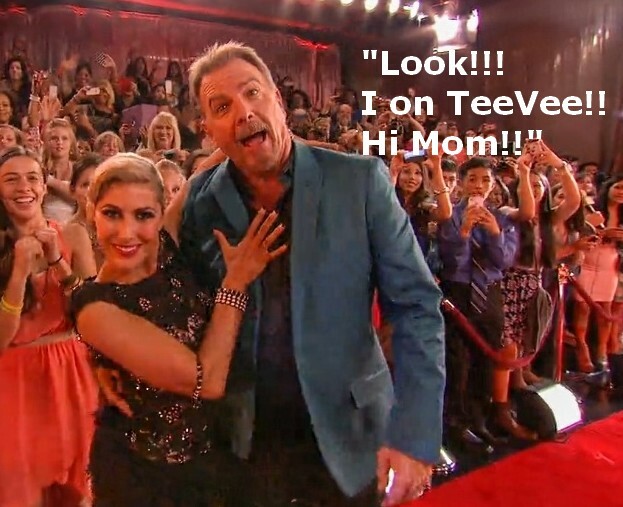 17 responses to "DWTS Season 17, Week 1 – Cheesecake Bytes"
OMG hahaha Henry!! I saw that live on the tv and actually LOL’d hahaha. The Nina comment omg lol love me some cheesecake!! Totally agree on the Cheryl comments. That dress was very unflattering to her body type and the cut-out navel really an unnecessary distraction. Her hair did look lovely and natural. I hope she keeps that look as it’s simple and attractive. I really wanted Cheryl to take a break, but I must say that I really am enjoying her and Jack. He seems very sweet and likeable and has a great message for anyone suffering from a debilitating disease. Delirious! Totally LMAO! Especially the last pic! LOL Derek’s thought bubble! I can’t handle it! hahaha love this! I like the smaller Cheesecake Bytes! All the snark, half the calories! HA! So, how about Bruno’s twerking during the pro’s opening number, once they were all out on the dance floor. He was twerking next to the end of the judge’s table and could be seen in the overhead shots. I thought I’d have to go gouge my eyes out. Hope he doesn’t twerk that way when the pros/celebs are seated on the magic bus stop. ROFL Bruno and the couches. Maybe Len requested the cast be placed next to Bruno so our Italian stallion would have someone else to throw himself on during his comments. @Courtney – Liking Cheryl? you better go take two and go lay down, you must be coming down with something. Bruno may be a tad too close to those hot male pros…. He may go MIA from the judges table and end up on the couches. Genius Cheesecake! ROTFL, especially re Cheryl’s (gag) belly crater and Derek’s “Nina” thought bubble. Love Cheryl’s hair this season too. Very funny Cheese and thanks so much for the laugh!! Yesss and Hooray for the Cheesecake! Cheryl’s dress just looked like sparkly Bacon to me. With the stripes of fat and meat? NOT calling Cheryl fat, she herself looks great. just sayin. Bacon Dress. Total lol on your comment about Henry, Cidra!! I must had missed the crater belly button. Any chance you have a pic? These were great, especially in the last pix, Val’s thought bubble. It was perfect! Thank you ladies for this, it makes me laugh every time. I love the Cheesecake Awards. I’m so glad you are still doing them! Seriously, you could park a Buick in Cheryl’s bellybutton.